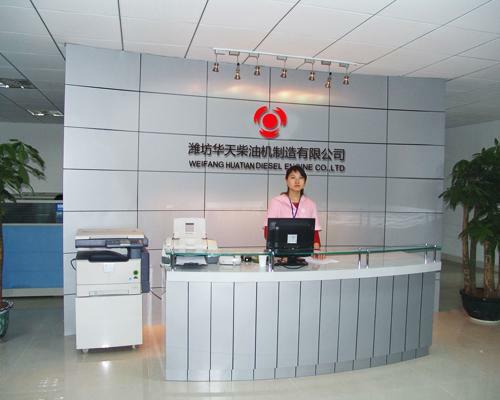 Weifang Huatian Diesel Engine Co., Ltd, is located in Weifang City, of Shandong Province. It is a professional company, in design, production of diesel engine, generator, water pump set, Gas Engine. We have advanced production line, high accurate testing equipment, completely quality control systems, as well as high level engineers and technicians and team of hard-working workers. Our products meet the Standard of ISO9001 and CE. Our main diesel engine models are 295, 2100, 495, K4100, K4102, K4106, R4105, R6105, R6113, R6126, HT618. With power range of 13.5kw/18.4hp to 300kw/408hp, and engine speed can be from 1500rpm to 2500rpm. Our engine can be used for generator, fixed power, engineering industrial machine, loader, agricultural machine.. We research and develop natural gas engine by ourselves. The models can be 295Q, 2100Q, 495Q, 4102Q, 4105Q, 6105Q, 6113Q and 6126Q, from 8kw to 100kw. The products are applied widely in the field of domestic oil, natural gas industry; large-scale livestock farm enterprise, biogas projects, coal field and landfill. Generator Set power can be from 8kw/10kva to 1000kw/1250kva. Coupled by world famous engine, such as Cummins, Perkins, Deutz, Daewoo, LovoL, Shangchai Weichai. And we also select high efficiency alternator, Stamford, Marathon, LEROY SOMER, etc. Depends on customer's specific requirements, we can supply all the designs, such as Open Type, Silent Type, Full Automatic Type, Mobile Trailer Wheels type, intelligent type generator sets. They are widely used and greatly appreciated in the electric power, the communication and the military fields. Huatian Series Products of mechanical engineering excellence application is so profound impact of our lives. Today, through the world, a strong sense of responsibility as the driving force solution provider, the customer has become the consensus choice. Supply the Strongest Machine & Offer Service Lifetime, as our company aim. Huatian Company will repay to client with more excellent products and service, under guidance of diversification strategy.